Discussion in 'Off-Topic' started by Entropy, Feb 13, 2019. NASA has officially declared an end to the mission of the six-wheeled rover on Mars. Opportunity lost power in a dust storm last June, and all efforts to make contact have failed. "The plucky robot operated on the red planet for more than 14 years — an astonishing achievement, given that the mission was technically supposed to last only 90 days." That is pretty incredible considering all the things that could have gone wrong. Not only that but how it was able to share so much of the planet with anyone who was interested. Such a fantastic outreach project. 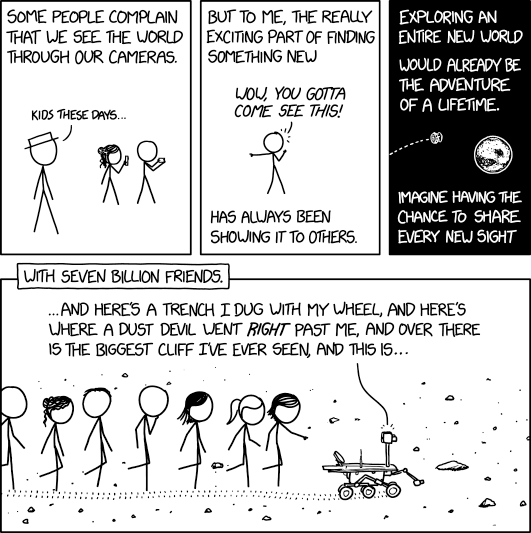 XKCD did this as a tribute today. Think of the technological advances we have made in 14 years. That's one thing that has fascinated me with our space exploration. We have more computing power in a watch than we had in many of our older probes that are still out there probing. Someday (maybe after most of us are dead), Opportunity will be recovered and put on display as a cherished relic. That's insane. We can't even get a phone now that lasts more than 2 without dying. That's probably by design though. Good thing InSite just landed in November with more landers planned. Really excited for the future of NASA. The next decade will see a lot of advances, starting by going back to the moon. Wow, maybe someday we can build a refrigerator or a washing machine that lasts 14 years. The advancements to our daily lives that have had their roots in space exploration programs are incalculable. May we never quit reaching for the stars. My "optimistic" response was not sarcasm - I am optimistic that you will be proven correct. The one thing Kansas has going for it: "Ad Astra Per Aspera," the state motto. I've always been fascinated by the stars too. There is so much to look forward to now that private enterprise has picked up the mantle of space exploration. How I wish DJT's dream for bringing mining jobs back to the US was by sponsoring asteroid exploration and granting mining rights to them. The plan is there along with the money. Now we just gotta figure out the science. It wont take that long. Musk will probably have it on display when he builds his house on Mars! That's an amazing accomplishment, and it's where our focus should be in space exploration. Let's stop this nonsense about manned exploration. Putting a human on a heavenly body not our own was a worthy goal -- we've accomplished that. Sending humans to Mars is a pointless endeavor. They'll be so damned weak from radiation, if by some miracle they even make it there, that the best they could do is plant a flag. And, they ain't coming back. We can learn so much more, and much more cheaply, by using robots for our space exploration. And yes, I am in complete agreement that our defense budget is obscene and dwarfs the space budget, but that doesn't justify this silly goal of sending humans to Mars (or back to the Moon). Yeah, I know it's dated, but that doesn't make it irrelevant. Flame away, folks!